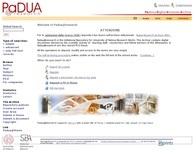 Padua@research is the institutional repository for the research outputs of the University of Padua, Italy. The repository contains electronic documents produced by professors, researchers and collaborators at the university. The full text of the items is available too. Phd theses are deposited in the repository as well.